Days of sparkle, festive Christmas trees, buttery warm cookies, slow cooked foods that cover the entire house with a delightful aroma and make you jump out of the chair and go lick a spoon in the kitchen, steal a cookie or open the oven door to check on that roasting goodie that makes your mouth watering with anticipation. Busy house with fancy dressed family. Rushing people on the streets cozzied up with scarfs and mittens while caring bags of produce and presents. Passing strangers and neighbors wrapped in their scarfs, mittens and bags, nodding to say hello and smiling in this holiday togetherness. Colorful wrapping paper, long ribbons covering the living room floor as boxes and items are carefully wrapped, stacked and placed under the tree. Christmas to most of us is about family and traditions. Celebrating them. Recreating them. Making new ones. And this year, as with any other year that I have lived away from my family, I celebrate it – always, by making a wall tree out of Christmas ornaments simply because my apartment is waaaaay too small to fit a real tree. Recreate it – as I cook an odd numbers of vegan dishes on Christmas Eve. Make a new tradition – as I celebrate it with new “by Love” family eating Lasagna while hoping not to anger the Gods that I broke the tradition and the “rule” and ate meat and not vegan food on Christmas Eve. And coming up with new or revised traditional Bulgarian dishes because sometimes is hard to find the ingredients, and sometimes because as new life comes and asks me to renew, to be open, to change and to make something new while preserving the core. So this year I decided to make, as always, the traditional bread with fortunes but with a new recipe. Make stuffed leaves, but rather than using ‘the hard to find’ grape leaves I am stuffing collard greens. And to make turmeric roasted carrots in place of the bean soup, not because I don’t like bean soup, in the contrary I LOVE it, but every year I eat too much of it (out of pure gluttony – hey, non of us is perfect) until my tummy hurts. So this year I decided to replace the soup with roasted carrots which I can eat by the loads without the belly ache. This recipe had fallen into my favorites box and which I have made a million times. Well, not that many times, but you get the idea of why something becomes my favorite – because it is insanely good and I crave it often. So why this recipe works? It is because the carrots are roasted with aromatics like turmeric and cumin. The cumin gives a middle eastern (and Bulgarian) flavor while the turmeric and the heat makes the carrots sweet and nicely roasted with that slightly brown exterior, soft but not mushy exterior and extremely sweet. The other part of the recipe that I love, even on its own or as an accompaniment to roasted potatoes, veggies or just to dip my bread are the carrot top pesto and the roasted garlic sauce. The carrot top pesto uses the entire carrot vegetable – the carrots, the leaves – yes, everything my friends. If you haven’t made or tasted carrot top pesto, let me tell you that it is so good that you might ditch your regular pesto and switch to this one, especially in the winter time when basil by the bunch is so expensive. This pesto has the same components as a traditional pesto but replaces the basil with carrot tops and handful of cilantro. The roasted garlic sauce is so rustic, full of flavor and easily addicting. It mixes roasted garlic with greek yogurt, lemon juice and olive oil that gives body and richness and it is whipped until smooth. 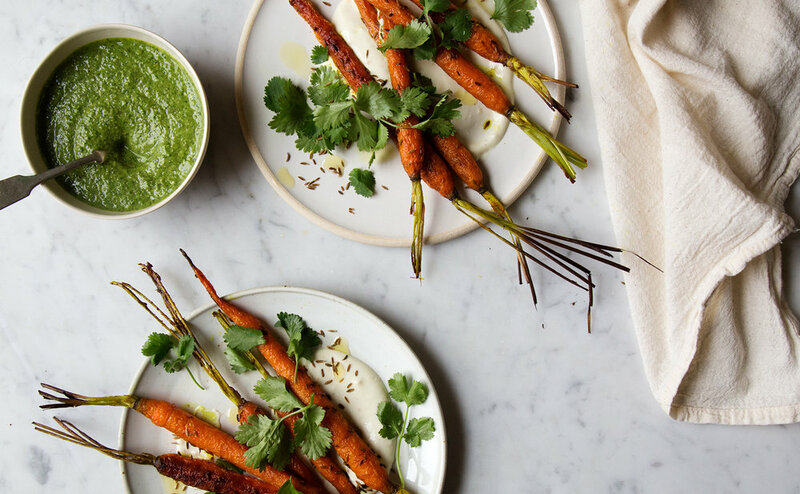 When laid as a base for the roasted carrots and accompanied by the carrot top pesto is, in my perspective, is a match made in heaven and so addictive that it goes into the favorites box and to be made a million times. Well, enough carrot-blabbing from me. I hope you have a very Merry Christmas with your family and loved ones. And don’t forget to celebrate your traditions, to recreate them and to make new ones as new life comes to you. Cut the large carrots in half and leave small/skinny carrots whole. Toss them with the olive oil, turmeric, cumin and salt on a rimmed backing sheet. Cut the whole garlic clove for the sauce and place it skin side down in the pan with the carrots. Roast, shaking the pan occasionally, until the carrots are evenly browned and tender 20 to 25 minutes. If your carrots are on the larger side, this might take a bit longer. If you like your carrots drier and sweeter (like I do) roast them for an attitudinal 15 minutes, but remove the garlic before doing that so it doesn’t burn. Remove carrots from the oven and set aside. Rinse the carrot top greens to dislodge any dirt. Pick out and discard any dry, yellowed, or otherwise unappetizing looking leaves. Discard tough stems. Place the carrot tops greens, cilantro, garlic, olive oil, lemon juice and salt in a food processor or immersion blender. Pulse several times. Scrape the sides down with a rubber spatula. If the mixture is too thick and hard to work with, add 1-2 tbsp of olive oil or water. Add walnuts and Parmesan cheese and pulse or puree until smooth. I like my pesto really smooth, so I puree it on high for a long time until no chunks are left. Taste and add more salt and lemon juice. Squeeze garlic cloves into the food processor bowl. Add the rest of the roasted garlic sauce ingredients. Wizz until smooth. Taste and add more salt, pepper or lemon juice. Spoon 1-2 tbsp of the yogurt sauce on 4 individual plates. Place roasted carrots on top. Sprinkle few cilantro leaves (optional). 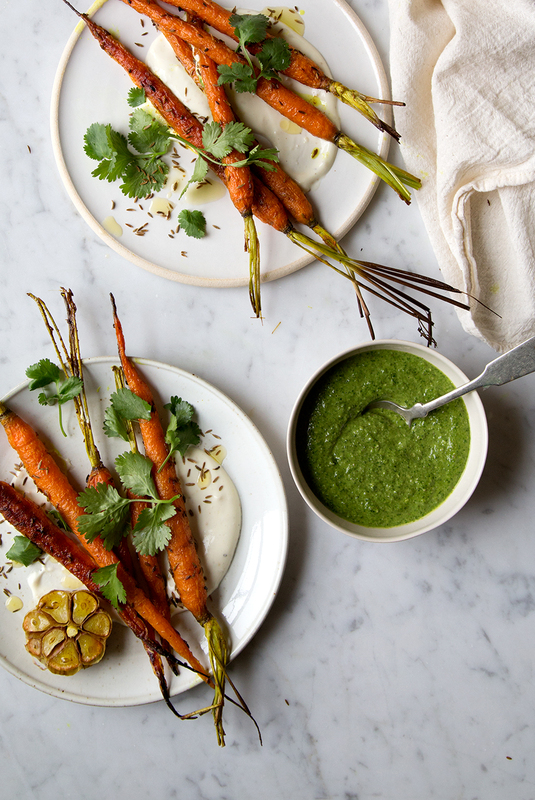 Serve with the carrot top pesto.